Advanced Pipes & Cast Co. The manufacturing process starts with the preparation of uPVC dry blend in a high speed mixer. The blend consists of pure PVC Resin and one pack of stabilizing system developed by reputed stabilizer manufactures to which are also added the pigments to obtain the required color. All these ingredients are mixed in a high speed mixer until the required temperature is attained. 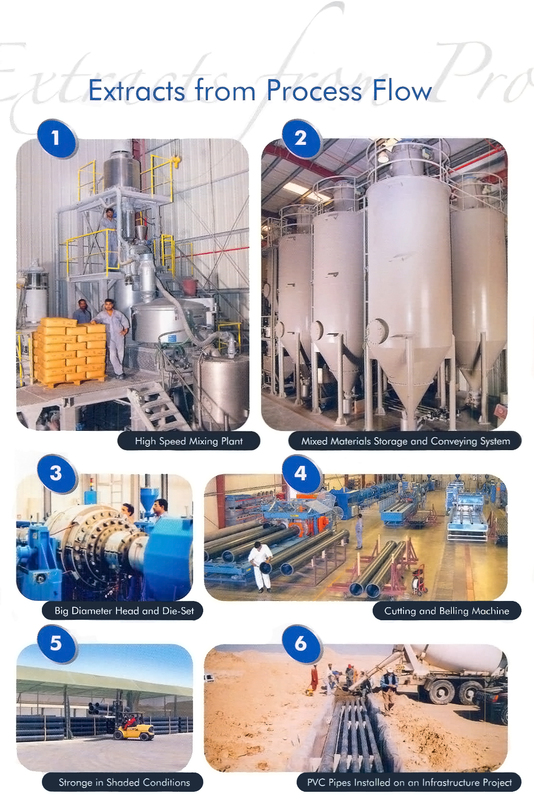 The hot compound is discharged into the cooling chamber and cooled to the room temperature and then discharged into a collection silo, that forms part of a fully integrated PLC controlled material feeding and storage system consisting of a total of seven silos. This system unique to Excellent Pipes, acquired at a very high capital cost investment, was found necessary to ensure consistency in material flow thus improving its properties and avoiding dust pollution. The material is allowed to rest in the silos before being transferred to the extruder, allowing it to give better mechanical properties in the pipe. From the time of feeding the raw material in the mixer to the stage where the finished product is released for packing, the system is fully enclosed with no human interference and this fully sealed integrated system helps to eliminate pollution and protect the environment. uPVC Pipe is manufactured by the extrusion process. 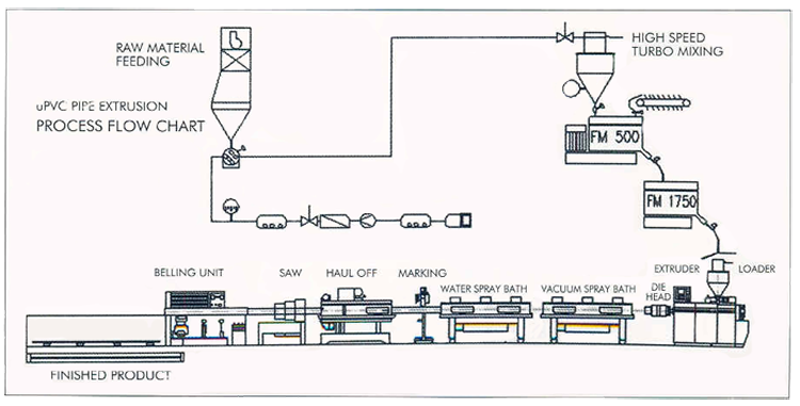 Twin screw extruders of both parallel and conical designs are used for extruding dry blends. The extruder mainly consists of a barrel and a pair of screws specially designed with nitrided surfaces to ensure proper plastification of the material. While the barrel is fixed, the screws rotate in counter clock-wise direction by the use of variable DC drive or frequency controlled motor through reduction and distribution gears. Depending on the size to be produced, a suitable die head is selected and assembled with the die set, and then mounted on to the barrel through an adapter. The barrel, the die head and die set are heated by a set of a heater bands and temperature is controlled through electronic controls. Once the required temperature is attained, the extruder hopper is fed with the ready mixed uPVC compound and the main motor started. The plasticized materials gradually come out of the die opening and once the flow is uniform, the extrudate is cooled and sized into a pipe. The OD of the pipe is controlled by a calibrator mounted in the vacuum spray bath. The pipe is pulled by a haul-off machine at a set constant speed to ensure that wall thickness is uniform throughout the length of the pipe. As the pipe passes through a saw machine, it is cut to the required length as per the length set in the computer. The cut length of pipe is then transferred on to the belling machine and the socket is formed prior to transporting the finished product to the crating area and finally to the storage yard for shipment. Copyright © 2018 Hedley Industrial Group. All Rights Reserved.